I got a call last May from one of the rescue groups I work with. Northwest German Shepherd Rescue had just gone down to California and picked up 18 dogs from shelters to bring back to Washington State. You can find out more about that effort here. Among the dogs was one old guy who they believed was on literally his last legs. 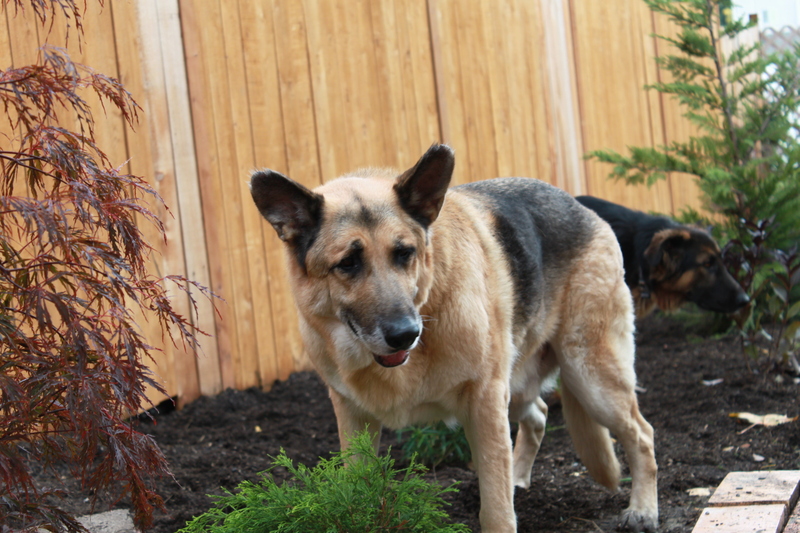 He had a severe case of Degenerative Myelopathy or hip dysplasia and they thought his kidneys were failing. His front teeth were worn down to nubs where they weren’t missing altogether. He needed someplace safe and warm to go for his final weeks or days. Of course, I said yes and soon Boomer (Beamer was his rescue name) came into our lives. We took Boomer in and immediately changed his diet. 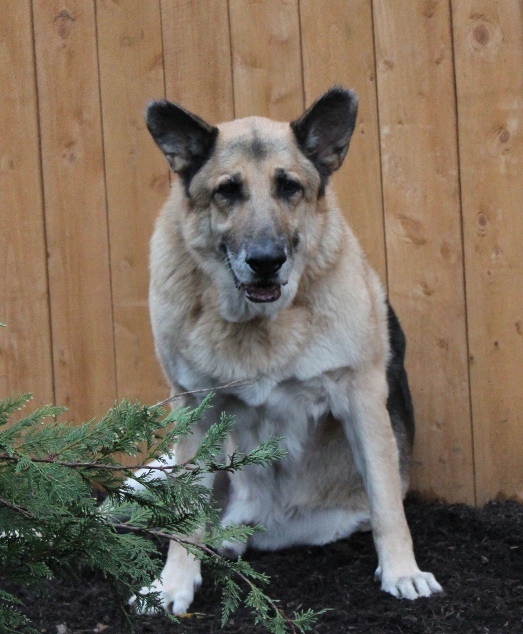 He went from whatever shelter food he had been given to two meals a day of high-quality kibble augmented by raw and eggs as well as glucosamine and aspirin. We planned to give him a great last few weeks. Independence Day came and went. He put on weight and his scraggly coat filled out and took on a healthy sheen. At first his walks were short and wobbly, but day by day as we walked the block, they got better and he began to open up. He started sniffing and exploring. He had that happy dog smile on his face and our walks stretched out to a full lap around the block. Labor Day came and went and he was still with us. Boomer took over Daisy’s comfy bed and made himself at home in our pack. 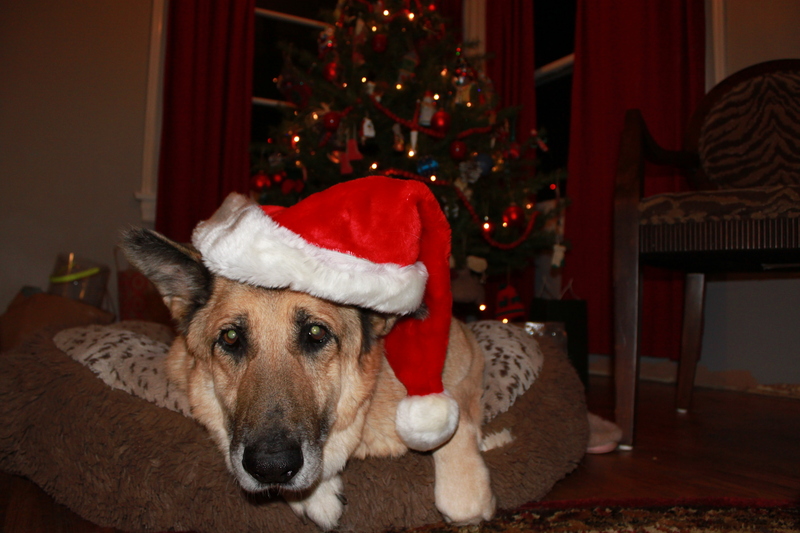 A vet visit for a senior panel of bloodwork showed he was as healthy as a 12+ year old GSD with DM could be. New Year’s Eve came and went and he was still with us. Boomer discovered daycare. He was not a huge fan of the little dogs that ran circles around him, but he was tolerant and loved the attention al the staff gave him. Also, not a big fan of his “spa days,” but grudgingly allowed himself to be manhandled around in the tub. Easter came and went. Boomer began having some trouble on his walks in late March. He couldn’t go as far and seemed to struggle even with the shortest of walks. As the calendar turned to April, he began having some incontinence issues and stopped eating- once the highlight of his day. He began having some terrible diarrhea issues, expelling black and tarry waste that smelled absolutely horrible. We gave him bits of steak, chicken, and his favorite treat- Goldfish. ( no, not real ones- the cracker snack!) He didn’t want any of it. He lay on his bed and whimpered. On April 10th, I took Boomer for a long drive to Highland Vet Clinic. We sat for a while and I told him he was a good dog. When the doctor came in, he didn’t struggle or fidget. He lay down and quietly left us. Boomer had come to us as a temporary visitor, expected to stay only a few weeks at most. He stayed with us for nearly a year and we hope knows that he was loved every day that he was here. While our time together was short, he will be in our hearts always.